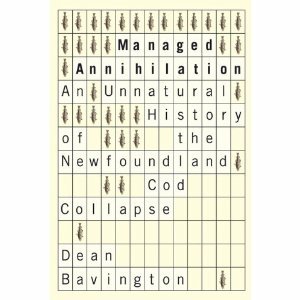 Dean Bavington’s Managed Annihilation moves the discussion of the Newfoundland Cod collapse in a new direction. As Graeme Wynn notes in his foreword to Dean Bavington’s Managed Annihilation, An Unnatural History of the Newfoundland Cod Collapse, “surely this topic, like the codfish itself, has been done almost to death.” Even with this abundance of works on the cod collapse, Bavington manages to make a sizable contribution by shifting the question from “who took all the fish out of the water?” to how the very concept of managing and regulating a single species resulted in the collapse of the cod stocks, and continues to endanger the codfish and other species. Bavington’s target is the concept of a single species management scheme that triumphed after 1949, and, even after the cod moratorium in 1992, did not face serious reevaluation and even grew as the prime means of environmental management. Throughout the book Bavington deconstructs the idea of a single species management scheme, discusses more recent holistically aware systems, and proposes alternatives to the current management regime. Bavington hopes to incorporate an awareness of the ecosystem, human experiences, as well as the markets for fishery products. Bavington bases Managed Annihilation on his experience in geography and the environmental sciences. This interdisciplinary focus shows in his consideration of a variety of historical, geographic, scientific, and philosophical sources to do both with Newfoundland and the cod fishery in particular, as well as the development and challenge to the concept of management more broadly. Bavington’s intellectual debt to American environmental historian and philosopher Carolyn Merchant is significant, in particular her work on environmental ethics and management. Bavington’s interest in providing alternatives to contemporary issues also has a strong basis in current thought in Canadian Environmental History, in particular to Cole Harris who, in Making Native Space, uses historical inquiry as a means to inform social and policy criticisms and recommendations. In addition to this activist element, Bavington is also constructing an institutional history of management, to identify how management systems were constructed and the limits of institutions in addressing broader ecological issues. As a work on institutional environmental management, Bavington is drawing upon landmark works such as H.V. Nelles’ The Politics of Development, particularly in his consideration of how economic goals can sometimes overrule the personal experiences of those directly affected by changes. Like Nelles’ Upper Canadians, Bavington’s fisherpeople are often underrepresented within the decision making process. They are subjected to a system of scientific and political control that does not seek out, or misunderstands, the experiences of those most directly involved in the fishery. While Managed Annihilation focuses specifically on the management of one species, his own suggestions and considerations go beyond the codfish to consider the impact of management on the ecosystem as a whole, as well as on the way of life for fishermen and those that depend on ocean resources as a food source. This is best expressed in his consideration for the impact of aquaculture both on the local environment and economy as well as on international fisheries and food supply. Bavington’s work is a significant contribution, but it is not without fault. His analysis could benefit from a greater consideration of the growth of industrialization in the fishery, particularly in the period prior to Newfoundland joining confederation, as well as of the resettlement policies in the post-confederation period, which shifted many fishermen away from small inshore fisheries to larger, more centralized, operations. Additionally, while Bavington considers the institutional politics of the Department of Fisheries and Ocean (DFO), he does not address how popular politics influenced management. While he is quick to point out DFO’s problematic consideration of fisherpeople’s experiences, he does not consider the effects of public perceptions on the management schemes that led up to, and followed, the moratorium. Questions of how the public questioned management, and how these questions may have affected political intervention in management regimes, go largely unanswered. A consideration of this political aspect, as well as internal information from the DFO about their own perceptions of the viability of their practices, would have added nuance to the discussion. Bavington’s work on the institutional, philosophical, economic, and ecological aspects of fisheries management is an important contribution to understanding the now 22 year old question of “who took all the fish out of the water?” While a deeper consideration for the obstacles to changes in management schemes, particularly political and business resistance would have strengthened the argument for alternative management models, Bavington does a remarkable job pointing to the pitfalls of ecological management as well as to possible solutions to help an increasingly fragile marine ecosystem. This book is a valuable addition to the long running debate on the collapse of the cod fishery, and should be of interest to any historian or student studying the development of ecological management and institutional systems. Citation: Joshua Tavenor. “Review of Dean Bavington’s Managed Annihilation, An Unnatural History of the Newfoundland Cod Collapse.” The Otter ~ La Loutre Reviews. (February, 2014). Graeme Wynn, “Foreward: This Is More Difficult Than We Thought,” in Managed Annihilation: An Unnatural History of the Newfoundland Cod Collapse, Nature, History, Society (Vancouver: UBC Press, 2010), xi. Cole Harris, Making Native Space: Colonialism, Resistance, and Reserves in British Columbia (Vancouver, B.C: University of British Columbia Press, 2002). H. V. Nelles, The Politics of Development; Forests, Mines & Hydro-Electric Power in Ontario, 1849-1941 (Toronto: Macmillan of Canada, 1974).